FlamTech® / 2 front pockets / 2 loose-hanging front pockets, one with extra pocket and tool loops, one with 2 small pockets / 2 back pockets with flaps / Leg pocket with flaps, phone pocket with flaps and velcro fastening and concealed ID-card holder / Folding rule pocket / Pre-shaped knees / Knee pockets with inside opening / Height adjustment for knee pads in knee pocket / Approved according to EN 61482-1-2 class 1, EN 61482-1-1 ATPV: 13 cal/cm² HAF:81%, EN ISO 11612 A1 A2 B1 C1 F1, EN 1149-5 and EN ISO 20471 class 1 - size C44-C50 and C146-C150. Class 2 - size C52-C64 and C152-C156 / Leasing laundry-tested according to ISO 15797 / Sizes D84-D120 available as made to order solution. 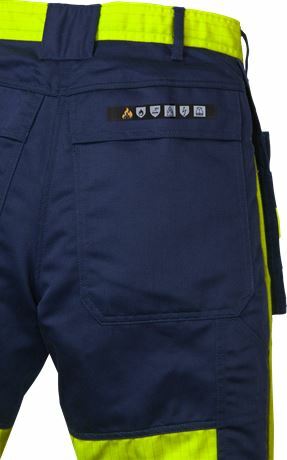 Material: 65% cotton FR, 34% polyester, 1% anti-static fibres, FlamTech®.